GOODYEAR, Ariz. -- Top Reds prospect Nick Senzel is no stranger to change. MLB.com's No. 6 overall prospect and the second overall pick in the 2016 Draft joined the organizaton as a third baseman with one of the best bats in his class. In his first two years in the Minor Leagues, Senzel primarily played shortshop. 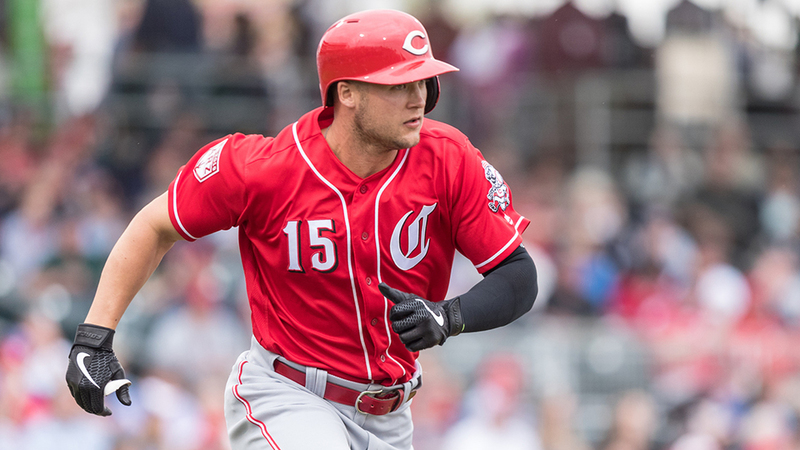 Last season, with third base blocked at the Major League level by Eugenio Suarez, the Reds shifted Senzel to a utility infield role. Now he's taken his second Spring Training with the big club as a chance to win the everyday center field job, regardless of the fact that he's only been playing the outfield for less than a year. "When the opportunity arose, I just knew I had good coaches and mentors to work with, and they've made it as simple as possible for me," Senzel said. "I have moved around a lot, but it's hard to pick out ... certain challenges about the position. I haven't really thought about it, actually. They've just let me go out and play and use my athleticism." That's how Senzel prefers it. The 24-year-old isn't big on analytics and analysis. Instead, he relies on hard work and routine. "It's like hitting," he said. "I've never been a big 'study the swing' guy, look at video, analytical sort. I take that same approach on a new position that I'm just learning. I try to pick up things as I go and game experience is the most valuable." Senzel has plenty of game experience, although he was plagued by injuries last year. His first stint with Triple-A Louisville ended in June when he fractured his right index finger and required season-ending surgery. Still, he was able to show his versatility, playing 28 games at second base, 14 at third and one at shortstop, all while putting up a .310/.378/.509 slash line with six homers and 25 RBIs. That versatility inevitably came in handy when the Reds kicked off Spring Training with just one everyday position open. That was center field, and with the Reds trying to add Senzel's bat sooner rather than later, the idea of transforming him into an outfielder began. "He's shown us that he can play center field -- not that he has it all figured out -- but that he has the ability to play out there," manager David Bell said. "We love his approach to the game. He's very competitve and he's going to have a long career, no matter what position he's in. What he's shown us this spring is that he's going to work hard." That work ethic is something in which Senzel takes pride. While most top prospects competing for a spot on the Opening Day roster may find themselves pressing to perform, the University of Tennessee product is more easygoing. He'd rather play the game and let his instincts take over. "You put more added extra pressure, pressing, it makes the game a lot harder," he said. "The game is already hard as it is, especially at this level. You're facing top-tier starters, you're with the starting guys. I just try to make it as simple as possible." He's succeeding. With a little more than a week to go before Opening Day, Senzel is still in big league camp and still making a push to start in center. And while he's known for his offensive potentially, he was adament that he doesn't want to be known for just his bat. "Defensively, I've worked extremely hard to become a good third baseman, to learn short, to become a good second baseman and now to be a good center fielder," he said. "I know [hitting] is the label on me, but I want to be good in all areas of the game." Because Senzel is so new to the position, the Reds may be hesitant to pencil him in for Opening Day. And while there are only a handful of Cactus League games left, Bell said the best thing for Senzel to do is keep playing. "It's the experience at this point. He's done all the drills he could possibly do," Bell said. "The thing that he's really going to need is just to continue to play in games. A lot of those games are going to be in Spring Training and potentially at the big league level, but we're not going to put him in a position that we don't think he can handle." Senzel, however, is confident he's done what he's needed to do to prove he can handle this latest transition. "At the end of the day, I feel like I've done everything I can do to put myself in a good position to make the team and show them that I can play center field," he said. "It's not ultimately up to me when it comes down to the final decision, but just knowing I've done everything I can is what makes it a little bit easier for me." Katie Woo is a contributor to MiLB.com. Follow her on Twitter @katiejwoo. This story was not subject to the approval of the National Association of Professional Baseball Leagues or its clubs.